Following is a link to Sir Steve's Guide with information on upcomming additions to the Vintage Collection as found in a Wal-Mart computer database apparently. And look, we were right, Logray will be coming at us as well as other great figures in 2011! So yays! Check it owt. Thanks to Sir Steve's Guide and member Tycho for the info. 2) Thank you for the new Wicket with his animated hood and pouch. Could you tell us what other Ewoks, if any, will be coming in 2011? Will they be all new Ewoks? Answer: Right now, we only have one Ewok planned for 2011 - an update to Logray. It looks like he will be all-new but we don't know yet if we will need our tooling budget elsewhere and will look to other existing Ewok parts for help. Even though Logray is the only Ewok for next year, we are still looking for opportunities in exclusives in '11 and '12. Ewoks are something that we would like very much to keep exploring - both updates to core characters, as well as new Ewoks, since fans have shown a great appreciation of all things Ewok in the last several years. Heres hoping we get an exclusive Ewok multipack though! I'm looking forward to Logray! 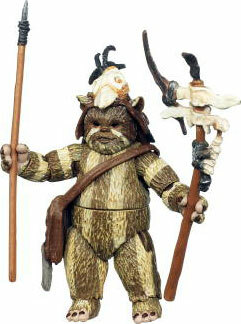 Being that he will also be a single carded Ewok like Wicket, I wonder what accessories will be added to up the value? Hopefully some goodies from the Ewoks cartoon or the Ewoks movies! I would like to see his animated series cloak but I'm not sure how they would pull that off. looking foward to captain fordo!!! AAA! Hmmm. Right. Because of that one scene, you remember, the one where Logray goes berserk and starts gutting Biker Scouts with his spear and magic helmet. Oh wait, no he didn'dt! Why are they packing Master Logray with a spear? Why? He never used one, not once! Durp. I kinda feel like he should've at leat come with his crystal image spinner or the Sunstar/Shadowstone on a base. Spear is just a re-paint of Wicket's spear. That being griped about, I DO like the sculpt on old Logray himself, and it's sweet that his elbows are jointed! Did Logray weild a spear in the scene where the Ewoks caught Luke & Co. in that net in ROTJ (was Logray even in that scene)? I'll have to pop in the old VHS and have a look. Logray uses a staff in all versions of ROTJ: 1983's release, Laser Disc, VHS, 1997's Special Edition, 2004's DVD and DVD recorded from Laser Disc. It will happen with the 2011's Blu-Ray editon, too. I'm sure looking forward to Logray, he looks really good! Oh, by the way, I finally got the new Wicket figure and should be adding new photos of him to the site before long. Not a date per se, but the girls i hang out with think I'm adorable with my Ewoks and figures in my room. One girl, Melissa loves Wicket. I make the Wicket figure cheep at her! "Ee-chu!" She always laughs. Yeah...chicks dig guys who like Ewoks. Good idea on the Logray spear for Wicket and keeping the rubber bands on him! Logray popped up on ebay today - hopefully that means he is closer to actual release - the deco on his face is also improved - yay! Yeah can't wait for this guy to hit, Logray and Bespin Han might be the only 2 SW figures I get for the rest of this year...unless an Ewok box set comes out at Christmas! I'm hoping to hear some news about the Ewok set as well, as it stands, a retailer hasnt picked it up since Hasbro last mentioned it, but hopefully someone will ask about the future of Ewoks at SDCC or via the Q&A. By the way, glad to see you posting - we'd like to hear from you more often. Sure enough DS, I don't have much to say about Star Wars these days, except for the Ewoks or lack of Ewoks...I always read what you have to say on Rebelscum, most of the time it's busting up a silly fight, but otherwise I like what YOU have to say. Yeah, I stand by my whole "What about making Star Wars figures from, y'know, before the Clone Wars" argument. And I too want to know what ever happened to that supposed Ewok set. Maaybe by Christmas...But Logray does look cool. He's got elbow joints! Rebelscum: You've mentioned an Ewok Multipack containing Chuka-Trok, Oochee and Widdle, as well as some other Ewoks (Princess Kneesa???) that was produced, but hasn't found a distributor yet. Is there any official word on that set? Can we expect it any time soon? I know that fans would eat it up. Every ewok produced goes for a mint on the secondary market. There is definately a market for them, and it would be a shame to have you not capitalize on that. When will we see the awesome Ewok Multipacks you've alluded to? Hasbro: Right, you can never have too many Ewoks. No new news on the Ewok multi-pack. To your other point, we still consider Vintage to be a true collector line and throughout 2011 and 2012 we will continue to include highly sought after figures and some more specific favorites as well. We have A LOT of new Vintage figures planned for 2012. I wish their answer made more sense. A lot of these answers require us to read between the lines - so I'm thinking more Ewoks are planned for the vintage line - rather than the multipack being released? Hope this is just a smokescreen for SDCC. Holy hanadak! Can you guys imagine a Chuha-Trok on a Vintage Collection EU card? With his pic from Caravan of Courage, his axe and his breastplate? Or a Vintage Collection Kneesaa with a new wokling and basket or her grappling hook? Maybe what they're hinting at is that they've slated them for 2012 along with Teebo? We can certainly hope so. At least they didn't say "NO! And we will nevah release Chukha-Trok, Oochee or widdle, and especially not Kneesaa! Bwah-ha-ha!" I'm just going to break down when I get paid and buy Master Logray on Ebay. Yeah, I'll be shelling out $17-$18.00 for a widdle plastic Ewok, and that's expensive, but all things considered, I'm better off doing that than waiting for our Wal-Mart (which only has a handful of old Vintage collection figures left, and is OVERFLOWING with a mega-surplus of blasted Clone Wars figures) to receive a shipment of Vintage collection wave 7. We never even got Wicket here. I found mine in Winfield at college. Anyone want some clones or another Annakin?We're choking on them at Wal-Mart in Bartlesville Oklahoma. On a related note, check out these Logray pics from yakface.com. He looks good. The spear he's so kind to bring with him will go to my Wicket, as you'll recall he lost his at college.